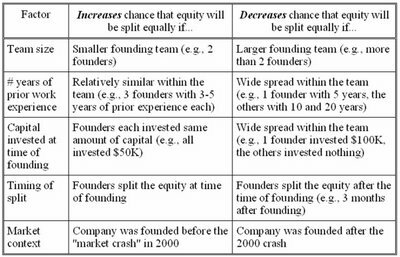 Interesting discussion here: Equity-Split Results: When Do Teams Split Equally?. Oftentimes, the easiest way to tell how “green” an entrepreneur is comes from their understanding (specifically, lack thereof) on startup equity. I think it comes from the fact that equity is not really a meaningful part of most peoples’ comp in any company other than the rapidly growing startup kind. So you often see conversations (and arguments) about the issues above. So it may be obvious, but anyone who’s joining a startup should be very careful about what % they are getting, especially if they are joining early enough that they are taking equivalent risk with the founders. My favorite experience tinkering on side projects has been to have 2 or 3 founders at most, all of them technical enough to prototype and code, but one focused mainly on business-y stuff (logistics, organizing, legal, etc.) and the others focused mostly on development. The worst dynamic, in my opinion, is when you have a pure business guy and a developer (or two) and the business guy spends all his time making projections and/or bossing around the developers with crazy visions :) It’s best if everyone works on the product and no one person has a monopoly on the vision or the customers, at the very beginning of a company. Either way, I’ve generally thought to split equity equally when everyone is taking about the same risk, particularly before the company has made any money. After all, joining a month or two later is not necessarily a big deal if the person who’s joining is worth it and deserves co-founder status. Otherwise, a couple percentage points here or there can create animosity that ultimately interferes with the success of the startup (which is hard enough as it is).